The Paris Feast: Rouen : Capital of Normandy, a day trip from Paris. 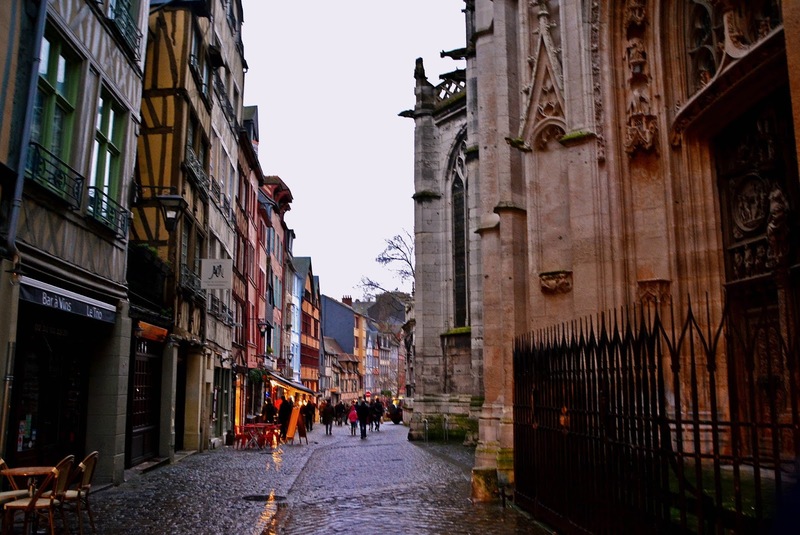 Rouen : Capital of Normandy, a day trip from Paris. It was in 1066 A.D. the Duke of Normandy, William, a descendant of the Vikings, successfully conquered and became the King of England, which paved the future of the two kingdoms of France and Britain throughout the Middle Ages and beyond. In 1604 Samuel de Champlain left the port of Honfleur of Normany and founded Acadia and thereafter the Québec City which defined the French presence in North America. And it was in 1944 when the Allied forces landed on D-Day on the beaches of Normandy that the course of the World War II and thus world we see today was defined. One city has been at the center of all these events, the capital and the most important city, Rouen. The city is just around an hour and half by train from Paris and you should not miss visiting it for a day trip from Paris. 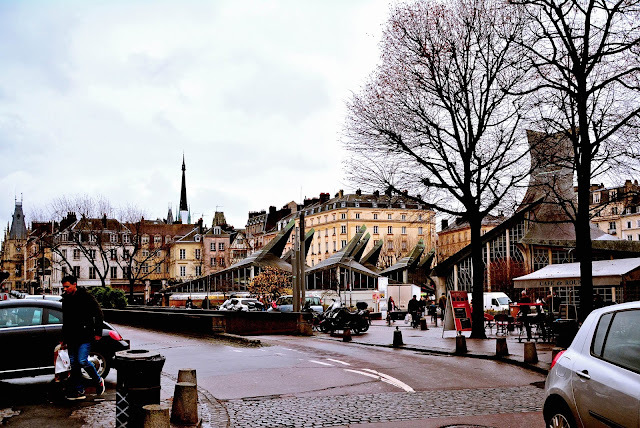 In the 9th century when the Vikings moved up the river Seine, some of them settled in the region of Rouen and called themselves the Normans, established the Dukedom of Normandy, and called the city of Rouen their capital. Favored by the trade along the river Seine, the port of Rouen flourished throughout the Middle ages, was an important theatre during the 100 year’s war and up until the revolution as a gateway to Normandy. A seventh century Roman church stood in the center of Rouen which was destroyed by the Vikings in the 9th century. A gothic church was then built in the 12th century and since then has dominated the culture and heritage of the city. Originating in the 12th century France, Gothic architecture, originally known as “Opus Francigenum” (French work) spread across Europe until the 16th century. The Rouen cathedral is the 3rd oldest and one of the most grand Gothic edifice of the world. Like other Gothic churches, the cathedral has a cruciform when seen from above with a “lantern tower” at the crossing. The tower like others was of wood, but after being hit by a lightening in 1822, the present one is made of cast iron. At 151m it was the highest in the world at the time of construction and still is the second, dethroned only by the Cologne Cathedral. Owing to its principal façade which has the rose window typical of Gothic facades, the Cathedral of Rouen is the largest in France. Two towers, the Saint Romain's Tower (left) and the Butter Tower (right) dominates the principal façade, all the three begin adorned by statues of saints and passages of the bible. The butter tower is so called due to the financing of its construction by amends paid to the church by those who consumed butter during the Lent period. The interior of the cathedral is awe-inspiring just like any Gothic cathedral with its thick pillars and the auxiliary chapels and of course the ornate glass windows. 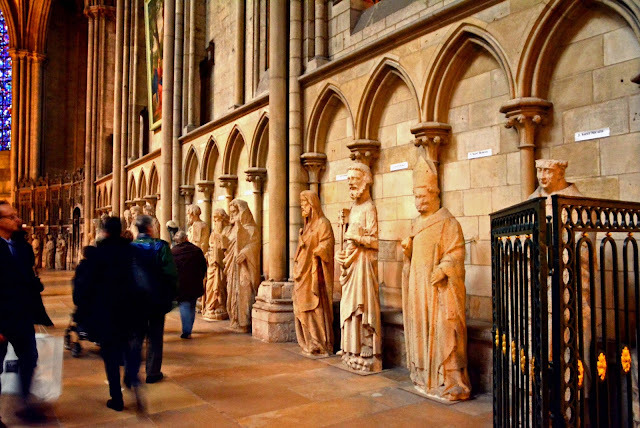 Inside the cathedral can be found the sarcophagi of the erstwhile Dukes of Normandy and other prominent figures of Medieval Normandy. The famous among them is that of Richard the Lion-heart, King of England and Duke of Normandy in the 12th century. The cathedral prominently featured in a series by painter Claude Monet, who rented a house facing the cathedral to realize his master pieces. 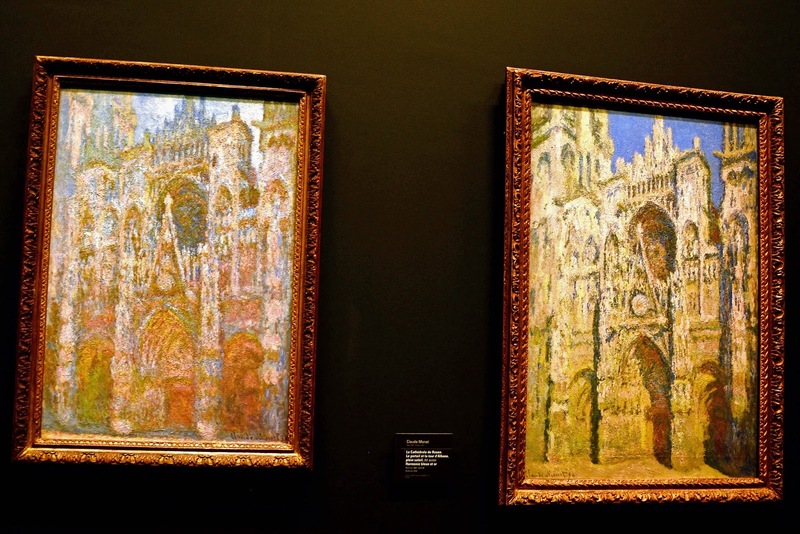 A major portion of that series can be seen in the Musée d’Orsay in Paris. The street leading west wards from the Cathedral across the square is called the Rue du Gros-Horloge owing to the presence of a giant renaissance era astronomical clock. The clock was installed in 1389 and is the oldest mechanical clock of France and the earliest one to survive in the world. The face is casted in wrought iron and is perhaps the largest clock using the particular mechanism to exist till date. 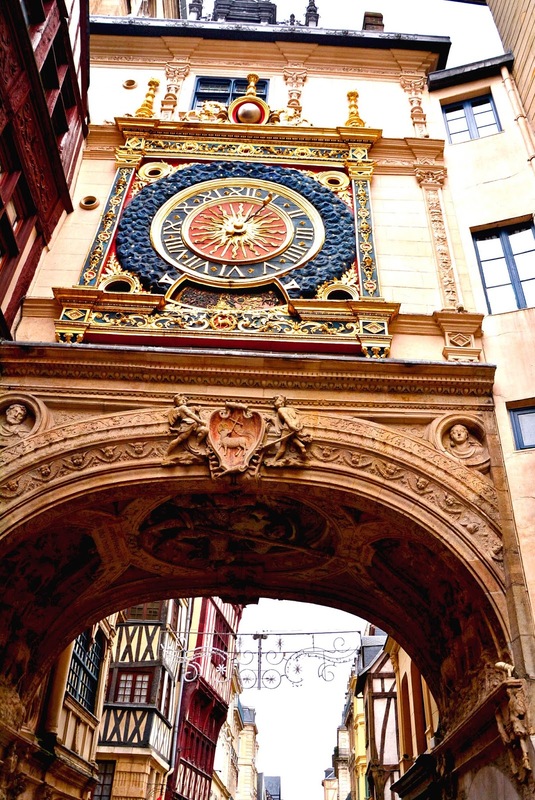 The renaissance façade was built in 1529 when the clock was placed in its present location. The façade consists of an arch which bears various symbols representing the city of Rouen. The phases of the moon are shown in the oculus of the upper part of the dial which completes a full rotation in 29 days. The mechanism was electrified in the 1920s and it was restored in 1997. Further west down Rue du Gros Horloge is the Place du Vieux-Marché, the original market place of medieval Rouen. The medieval look of the square is preserved till date with half-timbered houses bordering it. The market place still exists here and still fresh products such as sea-food or “100%” Normandy roasted chicken can be bought here. The hall is made of wood just like it was in the erstwhile era. If you happen to be there in winter before Christmas, like we did, you can also see Christmas trees being sold, and a giant wheel and a make-shift skating ring. Behind the market is the Church of St Joan of Arc, a modern unique piece of architecture commemorating the place where Joan of Arc was burned at the stake for heresy in 1431. This brings us to another important event of the history of Rouen, its link with Joan of Arc. As I mentioned in the very first line, since the Battle of Hastings of 1066, the French lords from Normandy held the crown of England as vassals to the French kings from the Capetian dynasty. All was well till the French King Charles IV (last of the Capets) died without a male heir. This sparked a succession battle between his nephew (son of his sister, Isabella, the Queen of England), King of England, Edward III and the French Philip of Valois, his first cousin in the male line. The battle lasted for 116 years and through three generations from 1337 to 1453 and what we know as the Hundred Years War. Initially the French lost ground as the English family marched beyond their Norman territories, until a teenage French peasant girl, Joan of Arc (Jeanne d'Arc in French) revived the French spirits and helped in a subsequent French victory, resulting in driving the English away from the French soil. However the young teenager could not live to see the French victory as she was captured by the English in 1430 and burned at the stake at Rouen, the capital of English Normandy. Relics of this historic event can be seen scattered across Rouen. The stake was at the Vieux Marché, where a cross and plaque commemorates the event. Joan of Arc was imprisoned in one of the towers of the Castle of Rouen which no longer exists. However one of the towers can be seen till this day and it is now called the Tower of Joan of Arc. Furthermore Joan of Arc was canonized in 1920 by the Catholic Church and thus the cathedral of Rouen holds a chapel of Joan of Arc. 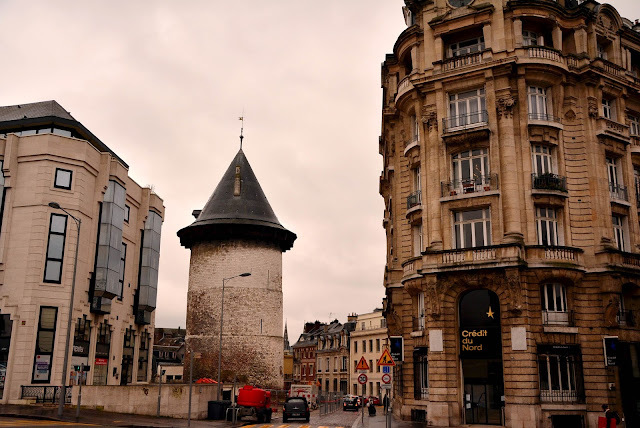 Today Joan of Arc is deeply rooted in the culture of Rouen and you can find streets, brands and business named after her, including chocolate macarons called Larmes de Jeanne d'Arc (tears of Joan of Arc). Numerous half-timbered houses have survived since the medieval ages and some dating back to the 13th century can be seen in Rouen. These houses were made with wooden frames with either stone or other infill to seal the gaps. The exposed wooden frame gives the facades a charming middle age look. In 1939 before the war, around 4000 such houses from the 12th to 15th century still survived in Rouen. After the war the number dropped to less than a thousand. A restoration project was launched after the war to reconstruct the houses in the same pre-war design. Today 2000 such houses can be seen mainly around the Vieux Marché, Rue du Gros Horloge and behind the cathedral on Rue Saint-Romain and Eau de Robec which together constitute the Old Town of Rouen. So make sure to take a walk through these narrow lanes and squares of Rouen to traverse the centuries and imaging one walking through the times when the Dukes of Normandy ruled these lands. We had lunch at La Tavola which is on the square of the Vieux Marché which is situated in a mediaval style half-timbered house. In Normandy you should try out the game meat which has a long standing tradition owing to the plenitude of red deer and other game. We tried the red deer in cranberry sauce. Apart from it the fish is also a must when in Normandy especially for salmon fans like me. Finally fowl in creamy Normandy sauce is another delight. As we were there during Christmas we had the opportunity to have capon (castrated Gallic rooster) which is a French tradition during Christmas. In fact here in France we do not have the tradition of roasting turkeys for Christmas lunches but rather the birds you see there are either capons or Guinea fowls. We also indulged in another French winter tradition, the Foie Gras. And finally for desserts, here in Normandy they have the inclination of putting apples in all dishes, so do not be surprised to see pieces of apples on your tiramisu. For drinks, the traditional Normandy specials are of course with apples and thus you should not miss the apple cider and of course the apple brandy Calvados. For details you can see my blog post on it from the archives. Normandy is also famous for its cheese and you can buy some of the best just across the square of Vieux Marche from La Fromagerie. Most famous Normandy cheeses are soft, creamy cow milk cheese and the four main types are the camembert (circular), Pont l’Eveque (square), Livarot (circular, pungent) and Neufchatel (heart shaped). I got myself a good load of cheese from La Fromagerie, including a camembert ripened with calvados. Just behind the Cathedral can be found the Church of Saint-Maclou which constructed in 1435 is one of the best examples of flamboyant Gothic architecture. Between the Cathedral and the Gros Horloge is the Palais de Justice, built in 1499 with a mixture of flamboyant Gothic and Renaissance architecture which served as the Parliament of Normandy until the revolution of 1789. The structure now serves as the seat of the courthouse of Rouen. Across the square, opposite the Cathedral is the House of Finances which was built in the 16th century and was the house that Claude Monet rented to realize his series of paintings of the Cathedral. If you can afford the time you can also see the Hotel de Ville (Town Hall) and the adjoining Church of St. Ouen, which is built in the same Gothic style and is as grand as the Cathedral. And finally if you love art you can spend some time at the Musée des Beaux-Arts de Rouen (Fine arts museum) to admire the art from almost all European schools from the 15th to the 21st century. If you happen to travel to Rouen during Christmas you can also immerse yourself in the magical festivities with the market in the square of the Cathedral. 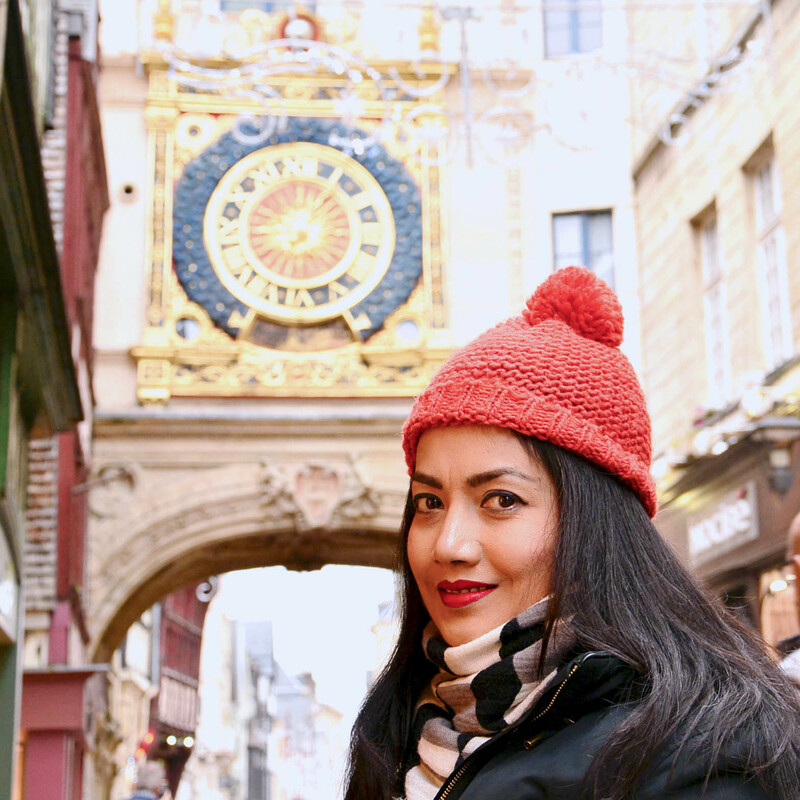 Though the Christmas market of Rouen is not one of the best in France, yet being so close to Paris, it is a one to visit more so after the Christmas market of Champs Elysees of Paris stopped to exist since this year. Nevertheless it is always good and refreshing to taste the warm mulled wine at the Christmas market and here being in Normandy, they also have Mulled Cider that comes with the local drink Calvados. And finally you would surely love to meet Santa Claus during the December festivals. best essay writing service. It's aids to me score high grade in my subject.